Ms. Houtmeyers oversees all aspects of the organization’s seven programs that serve 600 low-income women and children annually. The former executive director and patient care director of the Comprehensive Addictions Program at St. Elizabeth’s Medical Center in Boston, Ms. Houtmeyers was appointed President of the Center in September 2013. With a Bachelor of Science in Nursing and Masters of Science from Boston College, Ms. Houtmeyers is an accomplished senior leader with a proven record of success in developing behavioral health care management systems and creating services and operations responsive to people dealing with substance abuse, mental health, and domestic violence issues. She has extensive experience in risk management, program development, quality improvement, and contract and fiscal management. 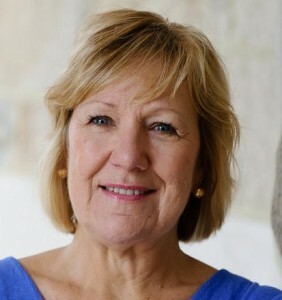 A lifelong advocate for Boston’s Allston-Brighton neighborhood, Ms. Houtmeyers is a member of the Massachusetts Organization of Nurse Executives and the Massachusetts Chapter of the International Nurses Society on Addictions, the Allston/Brighton Substance Abuse Task Force (Co-Founder and Co-Chair), the State Prescription Monitoring Program Advisory Board, and numerous domestic violence, health, and supportive initiatives for vulnerable populations. Joanne Hull serves as the agency’s Vice President of Administration and Finance as she joined St. Mary’s Center for Women and Children in January 2014. Ms. Hull has nearly 25 years of experience in finance administration, bookkeeping, and administration management. She began her tenure as a contracted independent financial advisor through Vaugh & Associates, P.C. where she was CFO, Controller, and Senior Advisor. She earned her bachelors of Science degree from the University of Massachusetts Amherst as well as various certifications from Northeastern University. Susan Keliher joined St. Mary’s Center for Women and Children in early 2014 as the Director of Development and Communications, and in late 2014 she was promoted to Vice President of Development and Communications. She brings more than 25 years of experience in fundraising and a passion for serving individuals, families and at-risk youth, who have experienced abuse, trauma and homelessness. She and her team raise $1.2 million in private revenue annually. She also supports the President’s efforts in securing and renewing government contracts towards the agency’s $6.2 million annual budget. Susan’s experience includes soliciting and growing annual fund support and planning special events. Also, she has managed corporate and foundation relations and created and implemented development and communication strategies. Susan has raised critical funds for The Second Step, Big Brothers Big Sisters of Mass. Bay, Brookline High School’s 12st Century Fund, Casa Myrna and RESPOND. Susan earned a bachelor of arts from Colby College. Crystal Parker brings 28 years of experience in human services and residential programs. With a rich history of leadership in St. Mary’s Center residential programs dating back to 2006, including serving as Program Director of Margaret’s House for five years, Crystal was promoted to Director of Residential Services in June 2015. In her role she oversees three residential programs on campus, and provides support to Crossroads, located in East Boston. She is responsible for program evaluation, relations with external agencies, licensing renewals, and trainings. Crystal has been recognized for serving as a mentor to new residential directors and staff. In July 2015, Emily Staecker, a licensed independent social worker, was promoted to Director of Clinical Services, where she leads the direction of all clinical, trauma-informed care of residents and participants in St. Mary’s Center programs. Previously Emily served as Program Director of Bridge Home for two years. She began her tenure as a clinician and was quickly promoted to Program Director, where she is widely regarded and respected by her staff. Previously, Emily served as a residential supervisor with Germaine Lawrence School for four years. Emily has a master’s degree in social work from Simmons College, and she earned her bachelor’s degree in psychology from Colby Sawyer College.